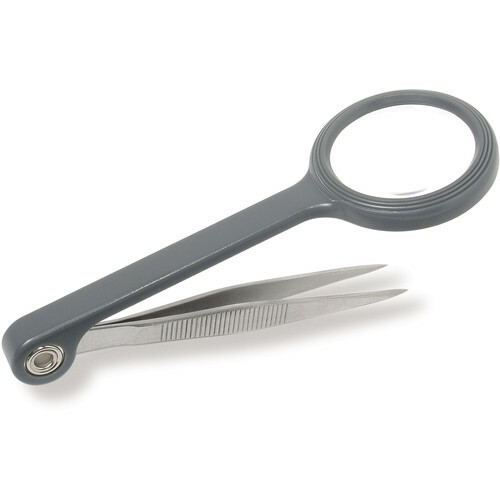 The MG-55 4.5x MagniGrip Magnifier from Carson Optical is a compact 4.5x magnifier with an attached fine-point tweezer. Not only can this lightweight magnifier be used for fine, detailed craft work, it can also be employed when you need to remove a splinter from someone's finger. Box Dimensions (LxWxH) 7.0 x 3.8 x 0.5"
MG-55 4.5x MagniGrip Magnifier is rated 5.0 out of 5 by 1. Rated 5 out of 5 by FotoSEGELN from Useful for repairs This tweezer is very handy if you are dealing with tiny screws, nuts smaller than your fingernail tip.